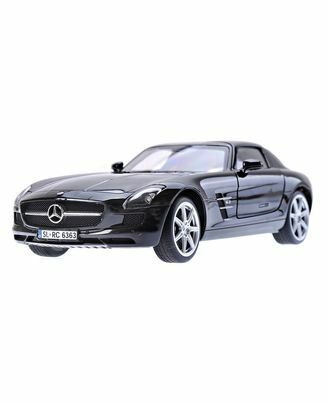 Remote Control Bluetooth Mercedes-Benz SLS 1:16. An R/C sports car that uses the power of your iPhone, iPad or iPod touch to put you in control of your vehicle and the music you listen to while cruising! Full gesture control allows you to control the car with the tilt of your idevice. Stream your iTunes library right into the high tech speaker system built into the car! Remotely activate the gullwing doors and use your vehicle as a speaker system. The app reflects the dashboard design from Mercedes and hobby grade directional, proportional steering and variable speeds give you the feel of real racing. Headlights, tail lights, signal lights, horn and doors are all triggered from the app! You can even program your vehicle to react to your music. Requires (4) AA Batteries (included). Phone not included. Materials: Plastic, Electronic Components. Assembled Dimensions: 10.5" L x 4.75" W x 3" H. Weight: 2.4 lbs. FROM THE MANUFACTURER :-An R/C sports car that uses the power of your iPhone, iPad or iPod touch to put you in control of your vehicle and the music you listen to why cruising. Full gesture control allows you to control the car with the tilt of your I device. Stream your iTunes library right into the high tech speaker system built into the car. Remotely activate the gullwing doors and use your vehicle as a speaker system. The app reflects the dashboard design from Mercedes. Hobby grade directional, proportional steering and variable speeds give you real feel racing Headlights, tail lights, signal lights, horn and doors are all triggered from the app. You can even program your vehicle to react to your music.